The cold weather continues to drive us to make warming soups and stews. This flavorful stew is easy to make – even when cooking the beans from dried vs. opening cans. The basis for this stew is sofrito, a savory tomato base used in many Spanish dishes. It’s also at the foundation of a lot of Caribbean cooking, but it means something very different there. It makes me think I need to make a great Puerto Rican chicken dish I learned years ago using sofrito . . . but I digress! This is a beautiful-to-look-at dish as well as tasty. 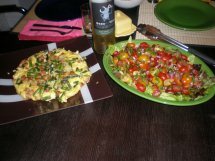 The original recipe was from a Food & Wine article on Familia Torres, a Catalan wine maker. Today we served this stew with their Sangre de Toro wine, one of my favorite inexpensive reds – delish! 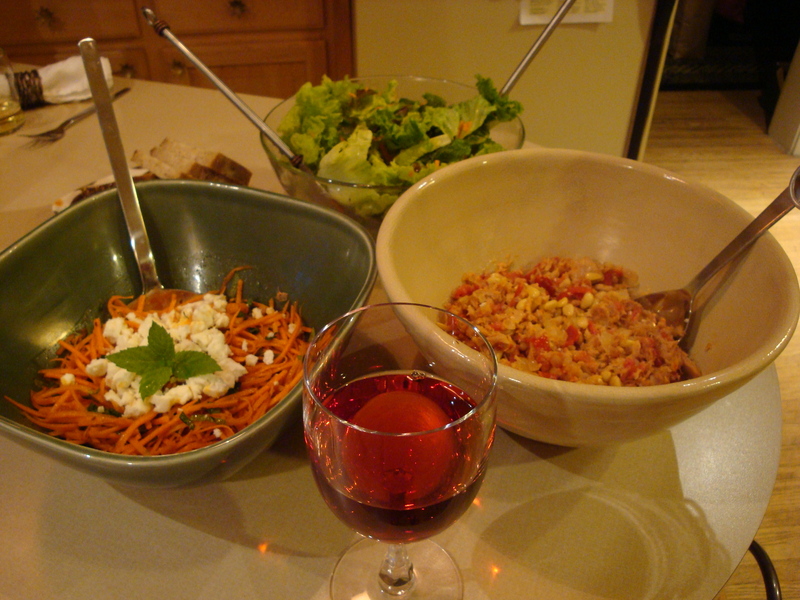 We loved the Arugula-Mint Salad from Sunday’s dinner so much that we’re having it again. It’s the perfect, refreshing foil for a rich stew. Prepare the chickpeas: Place soaked beans in a pot with water to cover by 2 inches. Bring to a boil, turn down heat and simmer till done, about 2 hours. Drain the chickpeas, reserving 2 cups of the cooking water. Set aside both the cooked beans and the water. This can be done a day or two ahead of making the stew. Prepare the stew: Place the olive oil in a Dutch oven and heat to medium high. Add the onion, rosemary and the bay leaf and saute, stirring constantly until soft. Add the garlic and stir for a minute or two until fragrant. 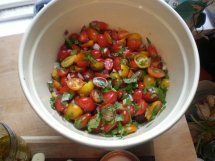 Add the drained tomatoes, bring to a sizzle and cook, stirring, for another 5 minutes. Add the 3 cups total liquid (1 cup tomato juice and 2 cups bean cooking liquid), the cooked beans and the chorizo. Stir to blend, bring back to a boil, reduce heat and simmer for 30 minutes. This can also be done a day or two ahead. The final step is to add the spinach, in 3 batches, stirring after each to blend. Simmer for about 10 minutes to wilt the spinach, but be careful that it doesn’t disintegrate from overcooking. NOTES ON INGREDIENTS AND AMOUNTS: The dried chickpeas added up to 5 1/2 cups cooked. 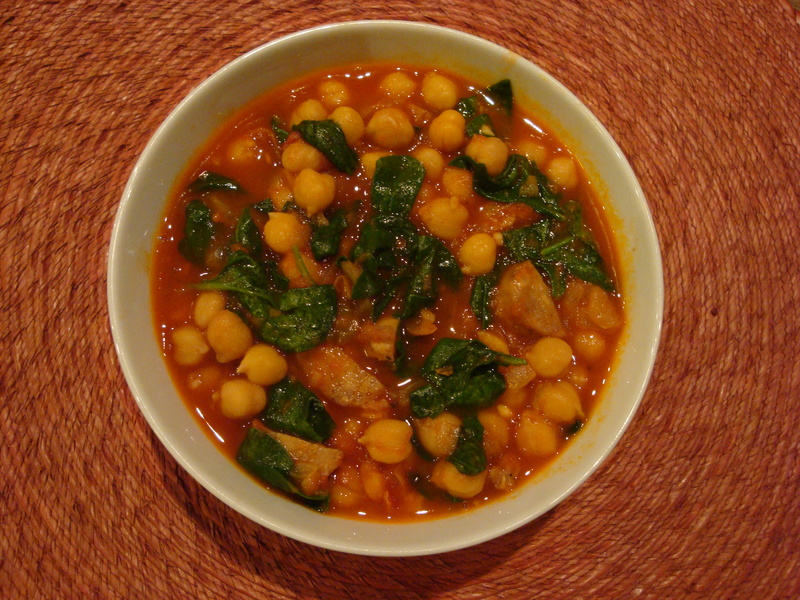 If you want to use canned chickpeas, you will need 3-4 15-ounce cans, drained and rinsed. If using canned, I recommend using 2 cups chicken stock in place of the bean cooking liquid. Make sure you are using (soft vs. dried) Spanish-style chorizo vs. Mexican. Spanish is fully cooked and Mexican is fresh. I used Chicken Chorizo from Trader Joe’s. The original recipe called for a pound of spinach, but I think this is a lot – use your judgment! The tuna is on the right and you’ll notice a glass of French Rose wine, which is the perfect pairing for this meal. Cut the pepper into ½ -inch pieces. Toast the pine nuts in a skillet until golden brown and fragrant, being careful not to burn. Set aside. Sauté the onion in the olive oil over medium heat until soft, about 5 minutes. Add the peppers and tomatoes and cook about 3 more minutes until the tomato is softened. Transfer to a bowl and let cool. After the vegetable mixture is cooled to room temperature, add the tuna and stir until mixed. Add the pine nuts and toss until combined. Serve with baguette. Margaux and I have been emailing back and forth lately about how we have noticed a focus on eggs for dinner in the food blogs we follow and the magazines we get. It’s been quite amazing how many things we’ve seen in the past couple of weeks, including a page on my Page-A-Day wine calendar about what wines pair well with dinner-style egg dishes! We both agree that we love eggs for dinner, so we took advantage of my visit to Chicago to make this delicious Spanish Tortilla. 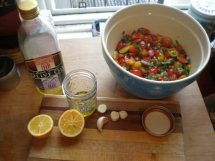 We also were trying to think of things we could make with Preserved Lemon when I remembered this great Moroccan tomato salad. It tasted really good with the tortilla! Margaux says . . . Ironically, I’d been making eggs for lunch and dinner for a few weeks before we even started talking about it. Its really easy, and I know Desi will eat it. So when we started going back and forth about it, I thought, “wow, everyone has eggs on the brain!” It must be a seasonal favorite. A note about the Chorizo: this recipe uses Spanish-style Chorizo which is smoked vs. Mexican-style Chorizo which is fresh. Since authentic Spanish Chorizo costs a pretty penny, I have always used the chicken Chorizo sold in places like Whole Foods or Trader Joe’s. This time we used TJ’s chicken Andouille, which is a good substitute. Place 1 tablespoon of the olive oil in a 10-inch skillet with sloping sides over medium high heat. (The best for this is either a non-stick or a cast iron like Le Creuset). When oil is hot, add asparagus and chorizo and cook, stirring, until asparagus pieces are just tender and chorizo is slightly browned, about 4-5 minutes. 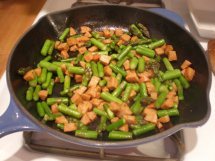 Remove asparagus and chorizo from the skillet and set aside. Remove skillet from heat, wipe with a paper towel and set aside. Whisk eggs, ½ teaspoon salt, black pepper to taste and the cayenne pepper to blend. Stir in cheese and 2 tablespoons of parsley. Place remaining 1 tablespoon olive oil in the skillet and set on medium high heat. When the oil is hot, but not smoking, pour half the egg mixture into the pan. Cook about a minute, tilting the pan and loosening the edges with a spatula. 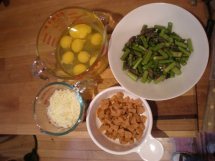 Sprinkle the asparagus and chorizo over the eggs and then pour in the remaining egg mixture. Reduce heat to medium and cook the eggs, continuously loosening the edges with a spatula and tilting the pan to let the uncooked egg mixture run under the cooked part. Cook until the underside is golden and set but the egg mixture on top is slightly liquid, about 5 minutes. Transfer the skillet to the center rack of the oven. Bake until top is set, about 4-5 minutes. Watch carefully so it doesn’t overcook. If the eggs on top are not done at this point, you can turn the broiler on and broil the top for 2-3 minutes. Remove skillet from the oven and let rest for a minute. Using a spatula, carefully loosen the tortilla from the pan and slide it onto a serving plate. (The tortilla will be half to ¾-inch thick.) Garnish with remaining parsley. Serve warm or at room temperature cut into wedges. Mix all dressing ingredients thoroughly and pour over salad. Let marinate for 30 minutes. Serve as is or over a bed of lettuce on a platter.